When guests enter your residence, you want them to feel welcomed and at home. All too often, however, foyers and front halls become akin to storage units – places to stash extra junk. Relegate this clutter to your basement or attic and use these six tips to create a smart and stylish entryway. While you most likely will not be sitting down in your foyer, it is a good idea to bring in a few chairs or a bench. When people enter your house with muddy rain boots, they will feel more comfortable sitting down to remove them instead of trying to balance uncomfortably. 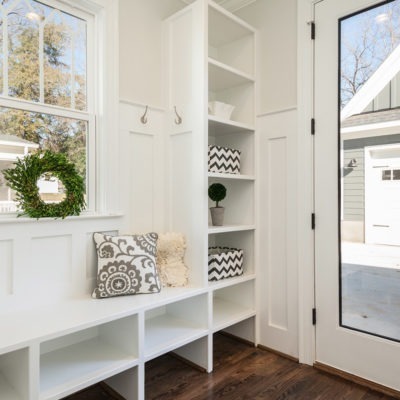 It also helps connect the area to the rest of the house, contributing to the overall flow of your home’s design concept and making it a less awkward spot. If your front hall has limited space, an antique trunk can double as seating and storage, notes Country Living magazine. To avoid having those stylish seats become covered in dirty outerwear, be sure to install plenty of hooks. If your space is on the smaller side, a wall-mounted coat rack is your best choice for maximizing space, recommends Style at Home. If you have more room to play with, try selecting a free-standing coat tree that fits your home’s design concept. Keep things organized and streamlined by having plenty of storage in your front hall. Style at Home suggests bringing in an umbrella holder big enough to contain the wet weather accessories of both your family and guests. Additionally, try purchasing a few bins in durable yet stylish materials like wood or canvas. These are great for holding shoes so they do not end up strewn around the floor. In the winter, use these containers to organize hats, gloves, scarves and other cold-weather necessities. In the summer, these can be used for outdoor toys, beach towels, and sunscreen so that you can easily grab them on your way out the door. Since your entryway is right by the door, it is usually subjected to whatever temperature it is outside. Since you want your visitors to instantly feel welcome, make sure you are creating a comfortable environment with the help of space heaters and tower fans. Opt for stylish, designer-inspired options that will blend nicely with the rest of your home’s decor. An important part of tying this area into the rest of your house and making it feel important and intentional is adding the proper decorations. The Spruce suggests hanging up a mirror. This will allow you to do one quick hair and makeup check before heading out and will let guests readjust after removing their coats and hats. Additionally, mirrors are a great way to play around with color and shape – try a starburst style for a retro 1960’s vibe, or opt for something more streamlined and modern. Since the foyer tends to be a more casual space, it is a great spot for displaying family photos and children’s artwork as well. The final touch for creating the perfect entryway is adding a small, functional table. Try putting separate bowls or trays on the table for each family member where they can drop their keys, wallets and sunglasses right when they walk in. Add a dash of charm by keeping fresh flowers, scented candles and a bowl of mints here as well.